I've decided that I need to make time to do some sewing for myself. 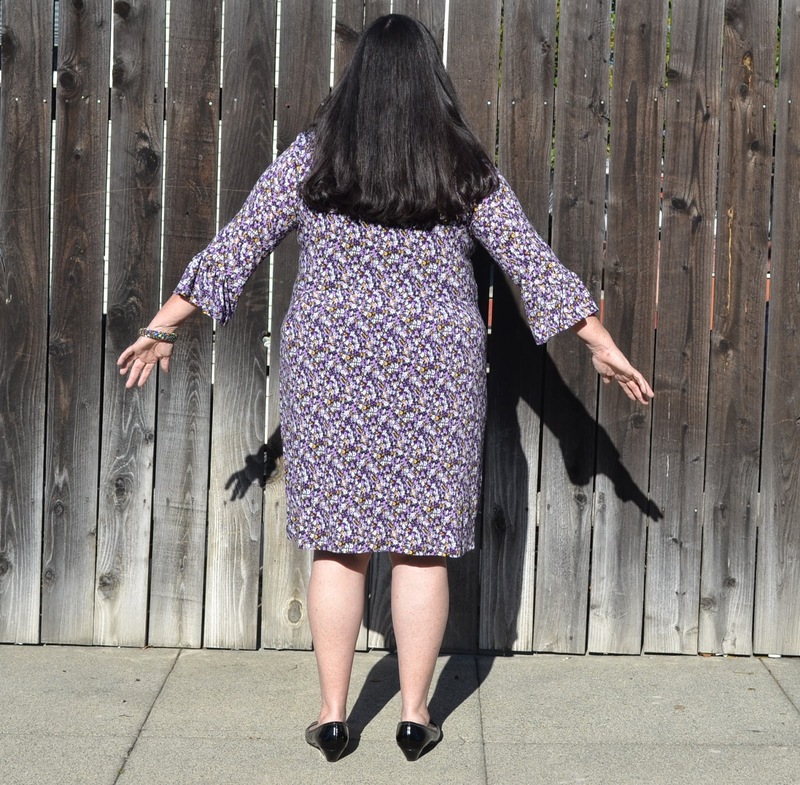 After losing weight this past summer, I gave away all my cute clothes that I've made. Now that I've gained it all back, I don't have anything to wear. I have been spending time shopping at the thrift stores so I'm not completely nakky, but I'm not dressing as cute as I used to. So, as I journey through weight loss again, I need to make some things to wear. While searching through my fabric collection, I've found some pieces that will work together for a mini wardrobe SWAP (sewing with a plan). I'm calling it, "Sunset Over the Sea," based on the photo at the top of this blog post. My pieces will include a black and a white cardigan, three printed knit tops and two pair of pull-on pants. 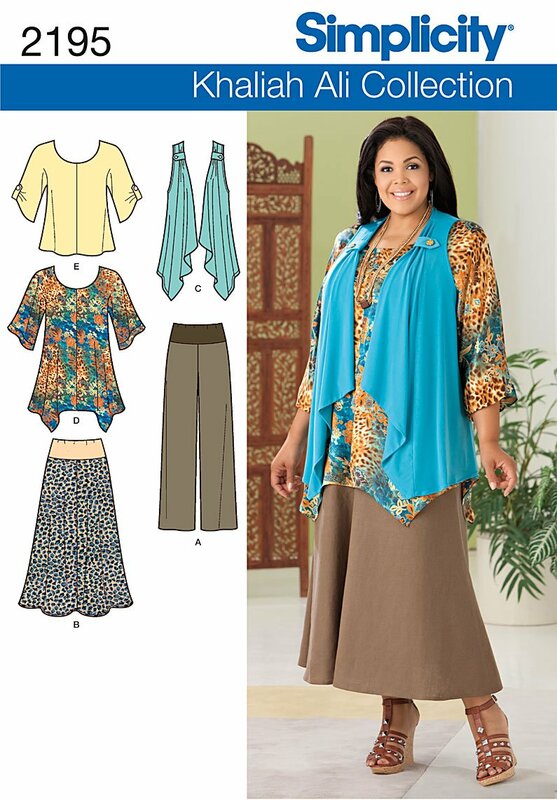 Each top will go with each pair of pants and the cardigans should go with everything as well. I started with the pant fabric choices, which are eggplant and teal. It was a lot of fun shopping in my collection. I have so much fabric that I really won't need to buy more in my lifetime. Of course that would be ridiculous. However, I'm planning on shopping in San Francisco for the Patternreview meeting at the end of April, so I'm saving my money for shopping then. These three knit prints are from Michael Levine's Loft, which I've mentioned before. I always find the greatest knits there. I remember Gigi Louis saying that good knits are hard to find, so you need to get them when you see them. This probably isn't true any longer, especially for me since I love so close to Los Angeles, but I still live by that idea. Burda 2569 is my TNT pull-on pants pattern. I've probably made it a dozen times or more. It's made for stretch fabrics, so every pair I've made from the pattern fit weather I'm up or down in my weight. I've also made pajama pants from the pattern with quilting cottons, but I add one inch at the side seams for a very comfortable fit. Unfortunately, the pattern is out of print, but you still might be able to find it on-line somewhere. The eggplant fabric I'm using for the pants is a Rayon/Poly/Lycra woven suiting fabric from JoAnn's and the teal fabric is a poly/cotton/lycra stretch twill from my local mill-end store. Both have just the right amount of stretch for my pattern. Luckily, I haven't lost this TNT pattern yet. I need a vault for all my TNT patterns. I still haven't given up hope for finding my TNT t-shirt pattern, although I have run out of places to look. 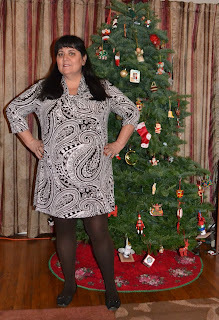 This is the pattern from my mini dress from my last blog post. I'm going to make the top with 3/4 length sleeves from the knit fabric with the colorful zigzag stripes. I think the print will be interesting with all the twist and gathers in the pattern. 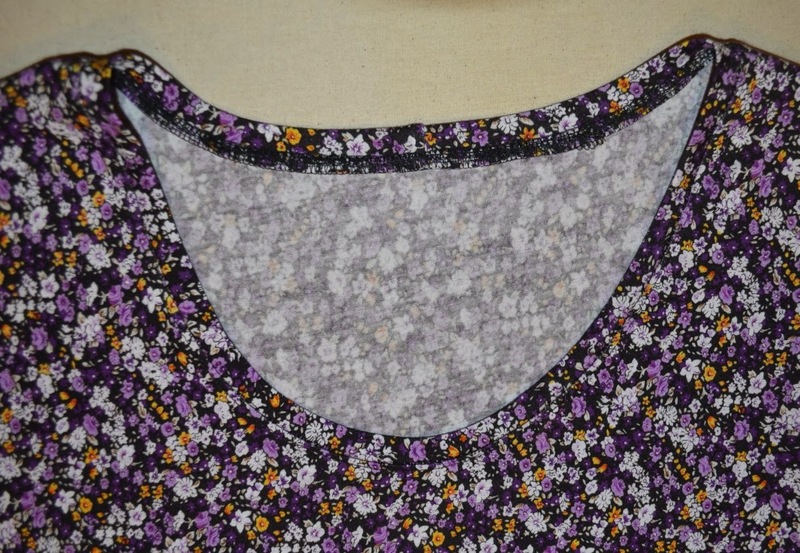 I'm using this pattern with the straight hem for the knit fabric with the black background. 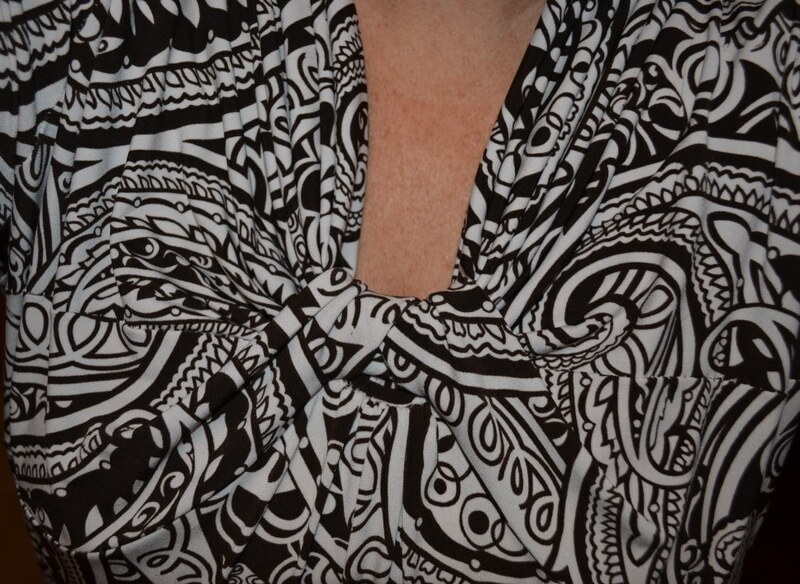 It has a pretty large print and would benefit from a pattern with few seams. I will eliminate the center front seam and the sleeve tabs. It will be a quick and easy top to make since I've already made it once before and know it fit me large last time. Oh goodie, a pattern I won't have to enlarge. 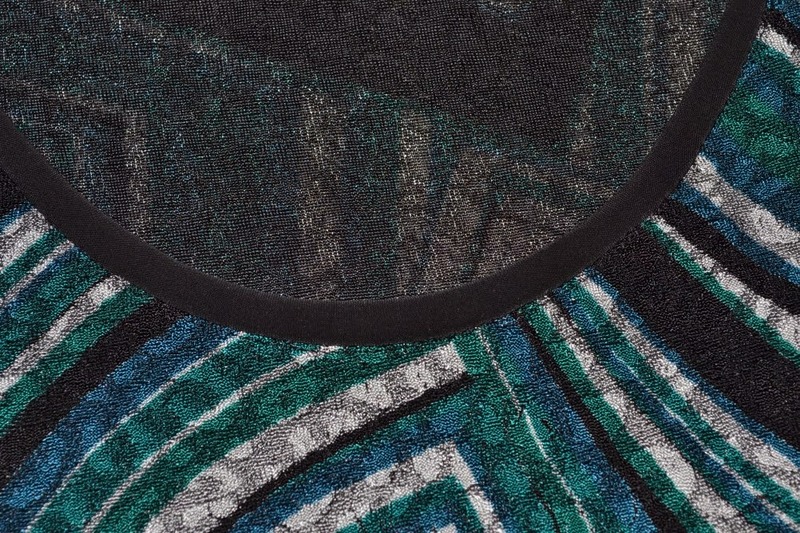 For the last knit fabric, the one with the green, teal, and purple with a white background, I'm making this hotpatterns top with the short sleeves. I've made the pattern before and really like it. The last time I made it I shortened the tie which makes it so much more wearable. This top will look good with either the black or white cardigan. Because one my tops has dolman sleeves, I decided that I needed to have one of my cardigans with dolman sleeves as well. I'm making the drape front cardigan from a black rayon/lycra jersey that has lots of drape. It's not very heavy and won't be warm, but it will help give my new wardrobe some polish. I should be able to wear this item with each of the tops. The other cardigan I'm making will be the jacket from this pattern. It's a raglan sleeve shirt style with no closure. While knit isn't one of the suggested fabrics, I will be using the heavy white cotton lycra knit. I will be adding a FBA rotated into gathers in the raglan sleeve seam. I think the fabric will be soft enough to handle the bulk of the gathers. The knit will also make this jacket easy to fit, especially since it has a pleat in the back for more room to drape over my behind. My plan is for these pieces to be quick and easy to make and fit without a lot of alterations. I hope they will be too big for my once spring is in full swing. Tomorrow I have a friend visiting after work, but by Friday, I should be able to get started cutting everything out. I expect to bang out a few items this weekend. I can hardly wait to have some cute, made by me, clothes to wear next week. While I wasn't blogging in 2012, I was doing a few things that was certainly worth blogging about. I still want to share them, though. I hope you enjoy them. 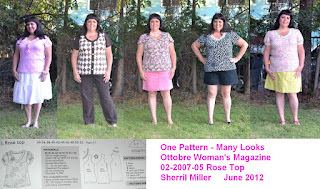 In June, the last month I blogged, Patternreview.com was having their One Pattern, Many Looks contest. 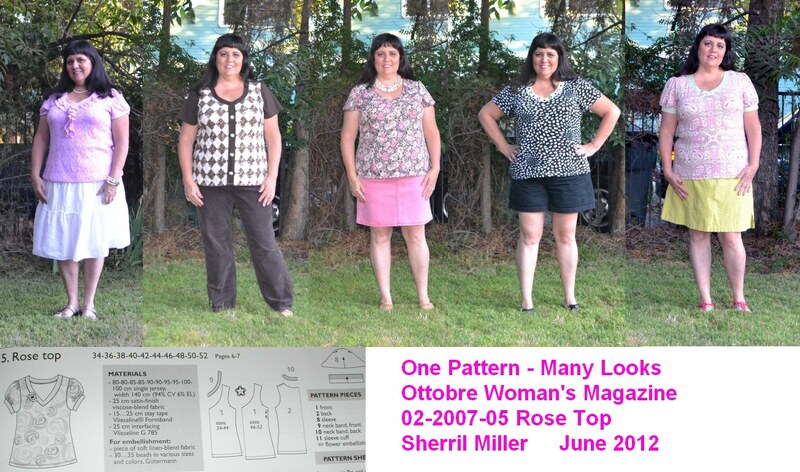 I needed some new tops, so I decided to enter using the now famous Rose Top from Ottobre Woman's Magazine. This was a fun contest because it really got my creative juices flowing. I made five tops, all different. 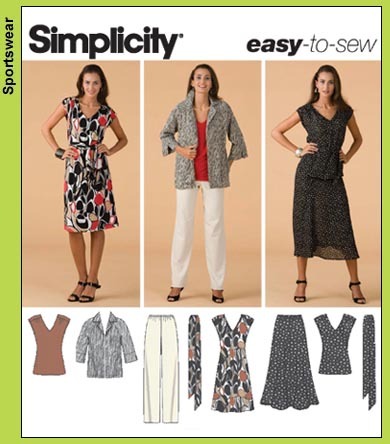 While I like them all, my favorite is the black one with the white dots and buttons around the neckline. I did wind up winning this contest. I got a $75 gift certificate for Vogue Fabrics and their swatch subscription service for a year. I haven't spent the $$ yet, but I will my friends, I will. 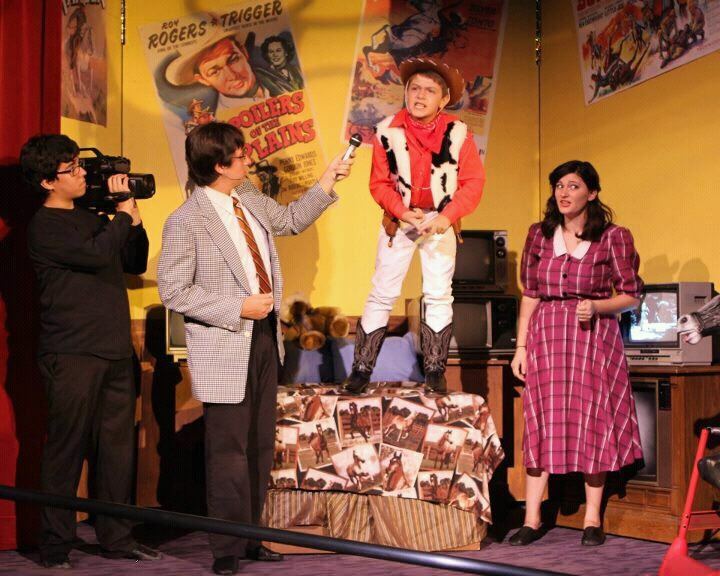 If you've been reading my blog much, you know that my son, Steven, is in a summer theater production every year. This year they performed Willy Wonka and I got to design, pattern draft and sew up 21 Oompa Loompa costumes. This is only a few of them that marched in the 4th of July parade. Didn't they turn out cute? 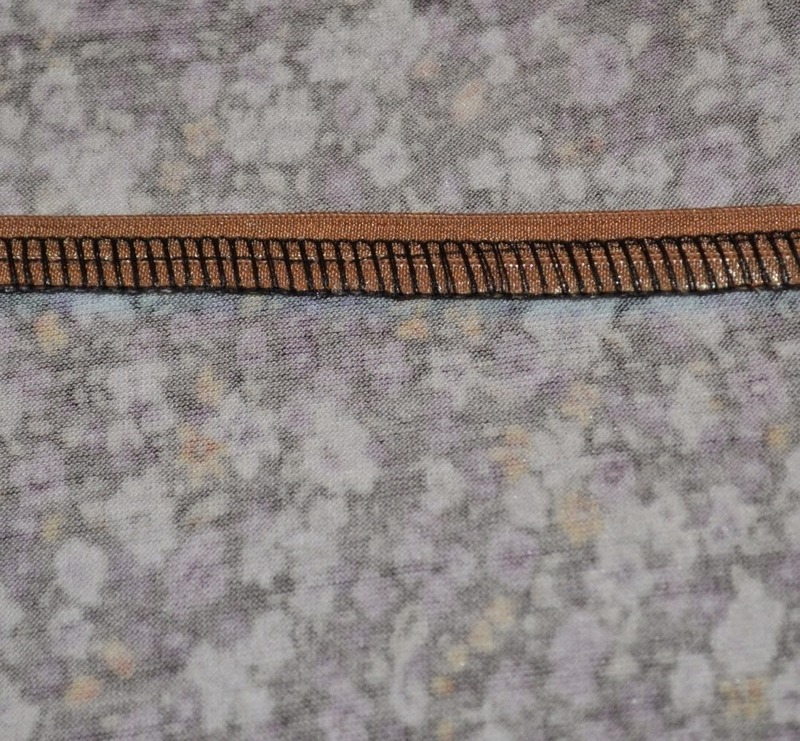 Actually, I had to make two sets of the cuffs and collars because after finding the thin striped brown and white fabric (pictured) and making the cuffs and collars, I found the wider stripe which showed up so much better on stage and I wound up making them all over again. That adds up to 84 cuffs plus extras for lost pieces, 84 socks, and 42 collars. My serger certainly got a workout this summer. July was spent on this project. My son is the one in the center with the glasses, just in case you were wondering. While rehearsing in the theater, one of the directors decided that the geese that laid the golden eggs needed something on their heads. Could I come up with something quickly? Well, of course I can! Didn't they turn out cute. Without the feather headpieces, they just looked like princesses. 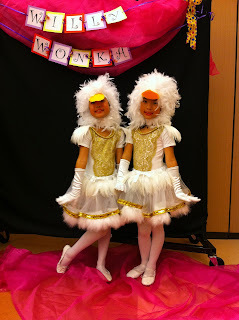 These two girls did a beautiful ballet scene and stole the whole show! And because I can't help but brag, Steven not only played the part of an Oompa Looma, he was also cast as Pheneous Trout, the TV Reporter that interviewed all the children that won a golden ticket. He did a great job on this production. I'm so proud of him. This year's play will be A Spoonful of Supercalifragelisticexpialidocious, which is a Disney review of songs from the Sherman Brothers and will feature scenes from many Disney productions . 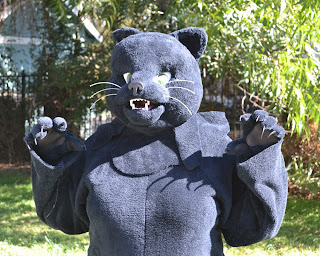 They have asked me to be in charge of costumes this year, but I have declined. I don't need anything else added to my plate right now. I will probably participate in making costumes again, as well as being the back stage seamstress during performances, in case of wardrobe malfunctions. Auditions happen in a couple of weeks. I hope Steven gets another great part. That covers June and July, but my biggest project to date is what I did in August. 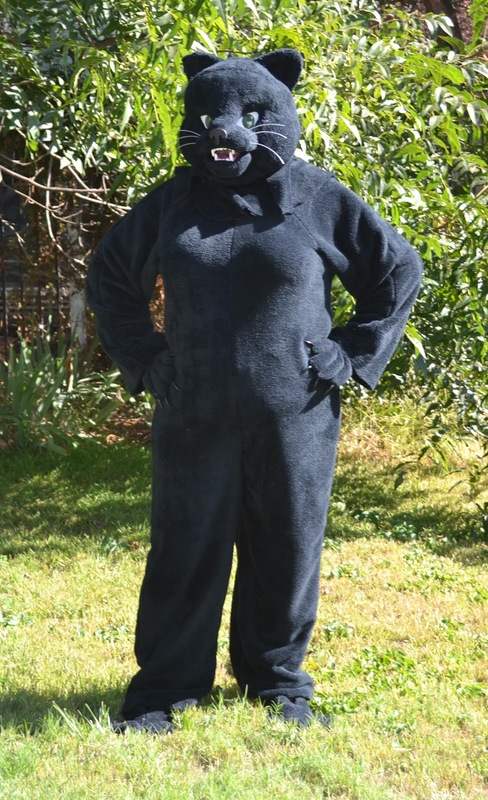 But first, let me take you back to The Ninja Girl costume of 2011. I swore I was just going to say no to any more projects like this. I'm a selfish sewist, which I freely admit. I hate it when something else takes away from my sewing for me time. 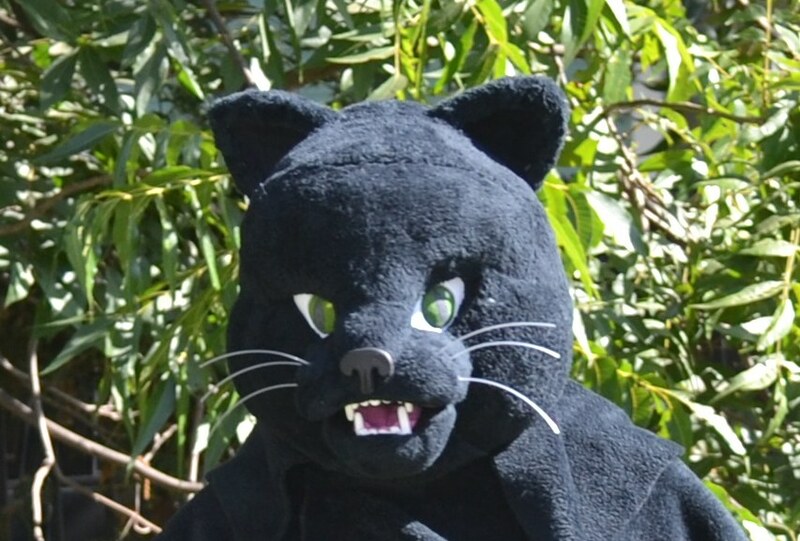 Then I got asked to sew the mascot for the school I sub at--for no pay. I really, really, really, really want them to hire me full-time after I get my credential. There is going to be a retirement and an open position and everything! 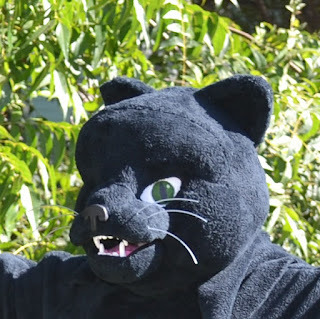 So for the price of brownie points, I made this fursuit with a mascot head. It was made for someone about 75 pounds lighter than me, but I still think you get the idea from this photo of me in the costume. I have never made anything like a fursuit head before. I don't know how we ever learned how to do anything before the invention of youtube. I watches a lot of videos, bought the supplies (they paid for those), and went to work. What I learned is that I have a really good sense of three dimensional objects. 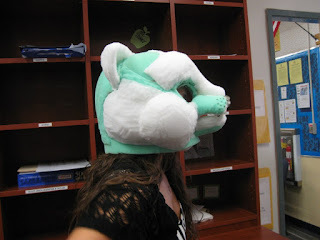 I think it comes from having a 3-D body that I have to fit when I sew. You can see that the first picture of the foam frame doesn't quite look like a panther yet. After making some changes, the second picture is very close to looking like I needed it to. The feet with the toes were super cute with fur and claws added. I don't think it turned out half bad, especially not knowing what I was doing. I love the nose and teeth. 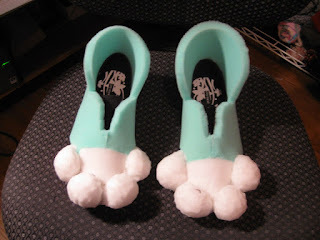 I made them out of fimo and the whiskers are made from weed whacker cord. 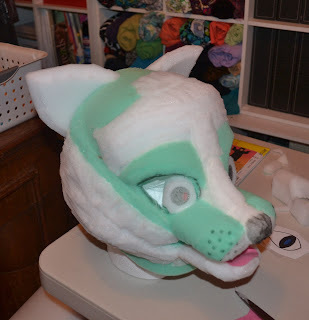 The eyes are made from buckram colored with sharpie markers and then rinsed to lighten the color and remove the odor. Also, I shaped the irises around an egg and let it dry into a round shape to give them the appearance of a real eye. You can really see through them too. To complete the look, I made gloves with leather pads and claws glued to the ends of the fingers. Everyone loved it. It was a very big hit. I just hope I get the brownie points and they hire me. Keep your fingers crossed because I really, really, really, really want that job. September through December was taken up with applying for and getting into Grad school and I began my classes. However, I took the time in November to enter one more Patternreview.com contest. 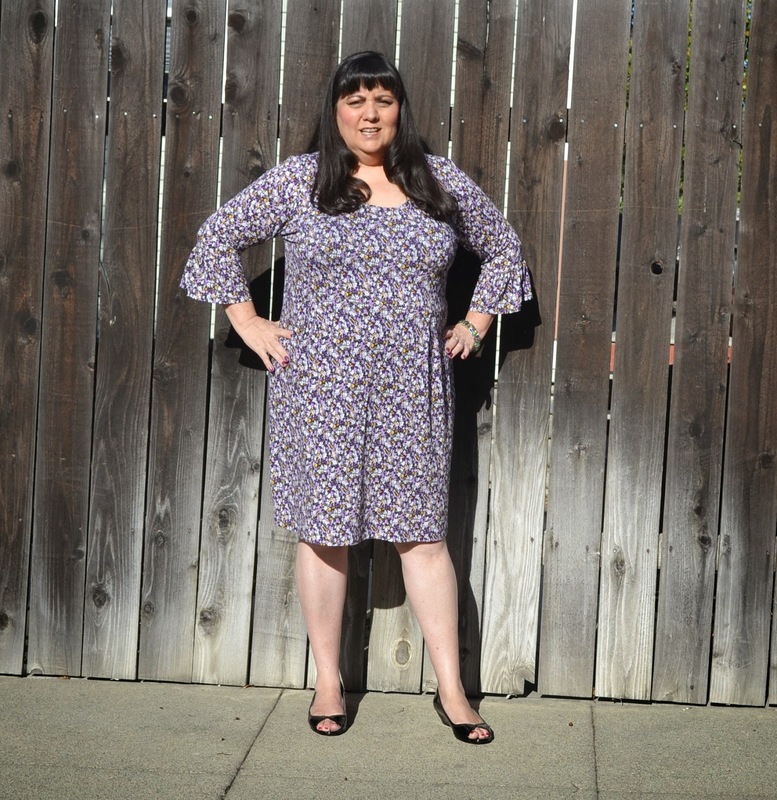 I have become a dedicated thrift store shopper, so the Refashion Contest was perfect for me. 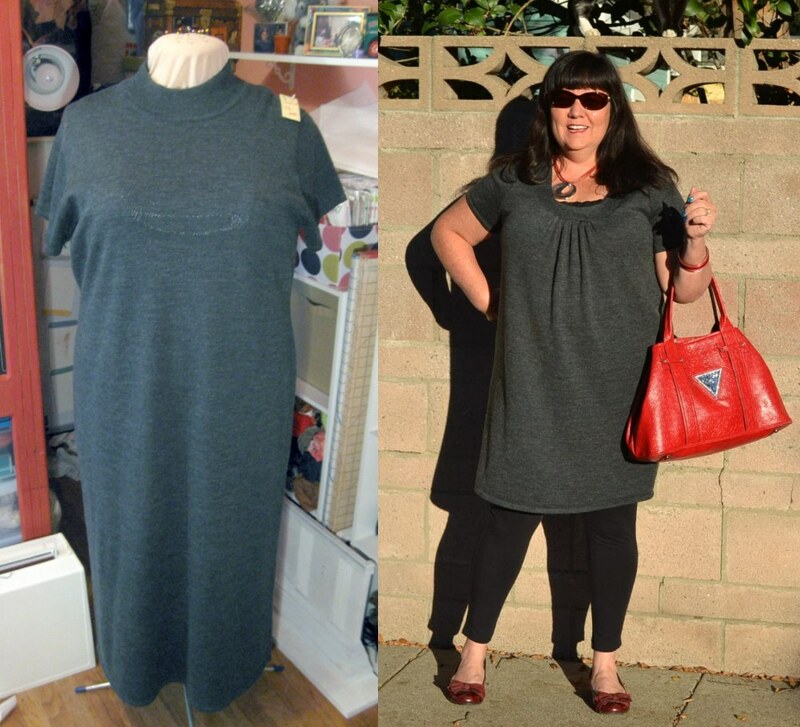 I found this ugly monk-like dress at the thrift store for under $4 and turned it into a really cute sweater dress. I love the way it turned out and wear it often. I didn't win this contest, but I did get 4th place. The prize was a good one too, so I'm sorry I didn't win. It was the Thread's Magazine Archive on DVD. Now I guess I'll have to buy it myself. So there you have it, what I did with the second half of 2012. I didn't want you all to think I was a slacker. The first miracle of 2013 was that I blogged. Technically my last blog was at 10:30 New Year's Eve, but for most of you it was already 2013. I got so many nice comments on that blog post that I wanted to blog again right away. Thank you for all your nice words of encouragement. It means so much to me. The second miracle is that I sewed something. Something wearable, in fact. 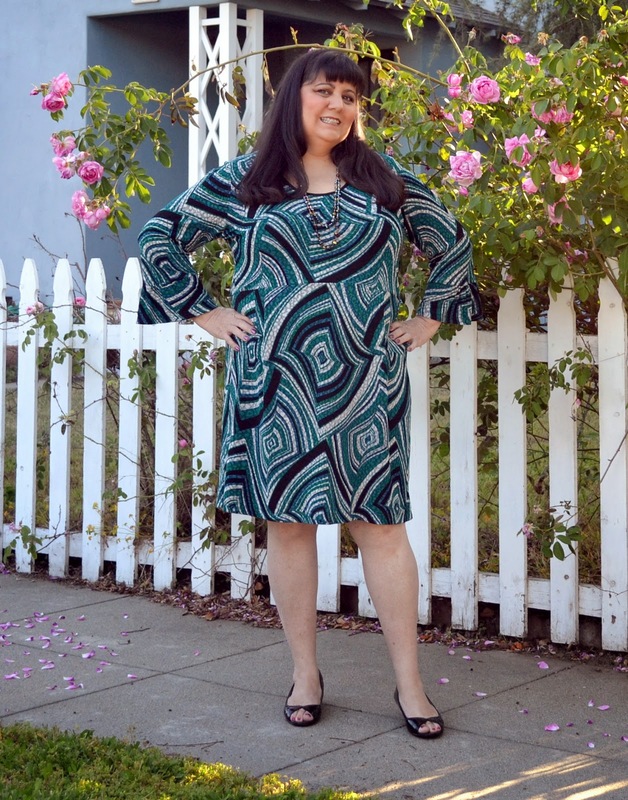 This is Simplicity 1716, which is described as a mini-dress, tunic and top. And mini it is! 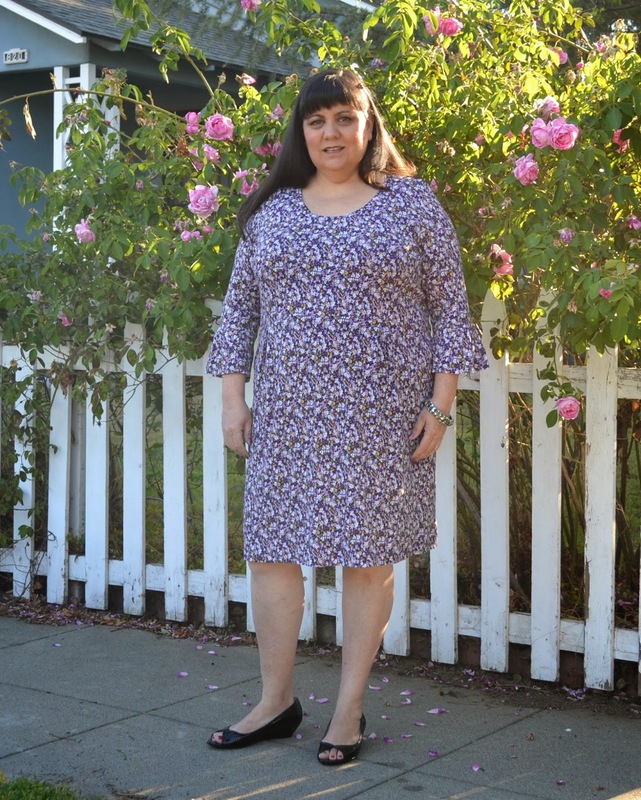 I shortened it two inches at the waist and gave it a two inch hem. It hits me at an awkward length. 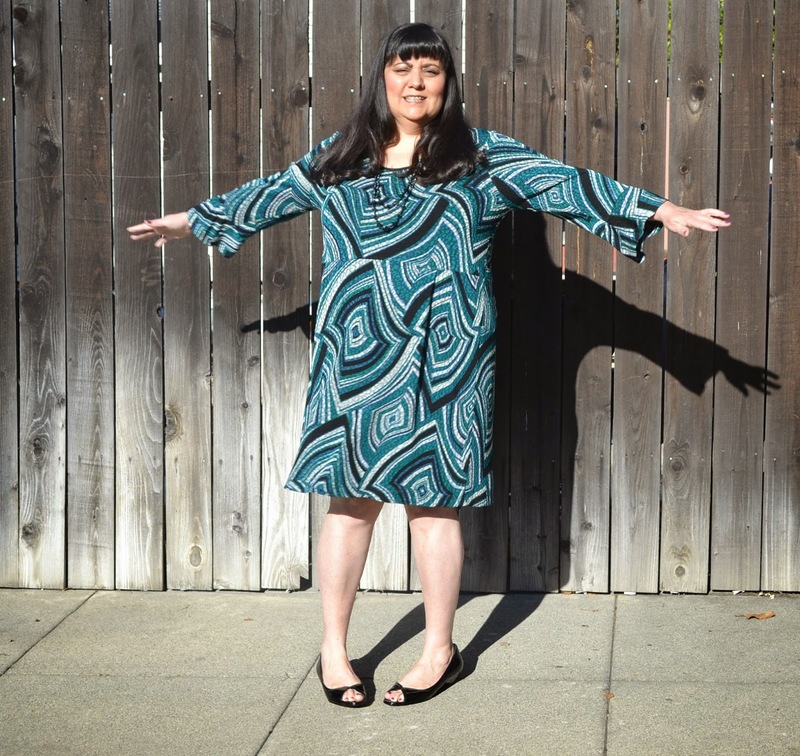 It's too short for a dress and too long for a tunic. I think it might work with leggings, but all I could find were tights. Don't worry though, I won't be going out in public with this in tights. It looks longer in the picture than it does in my mirror. I didn't get any pictures of it, but this looks really good with a brown cardi. The fabric is a soft poly lycra jersey that I got from Michael Levine's Loft for $2/pound. I love that store so if you are ever in the Los Angeles area, call me. We'll go shopping! I was drawn to this pattern because of the interesting drape in the front. It's sort of a play on a twist top, but much more modest. I don't want to flash the middle-school boys, so I try to always cover myself up. 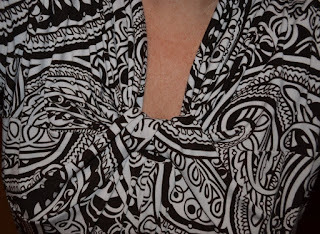 I hope you can see the interesting neckline in this picture. 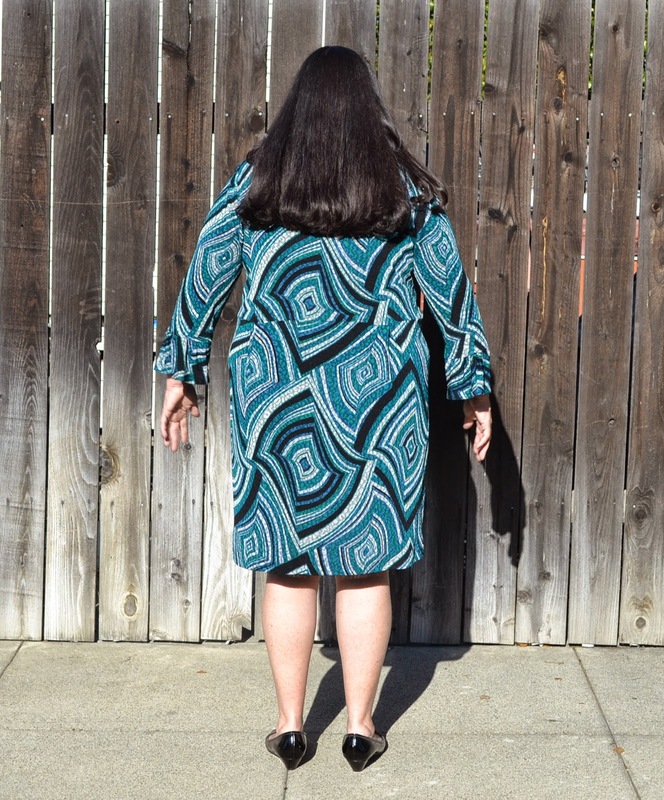 I know the fabric print is quite busy, but click on the photo and it should magnify for you. The pattern cover photo shows a more rounded shape but they have those tucked in pieces arranged a bit differently than I do. 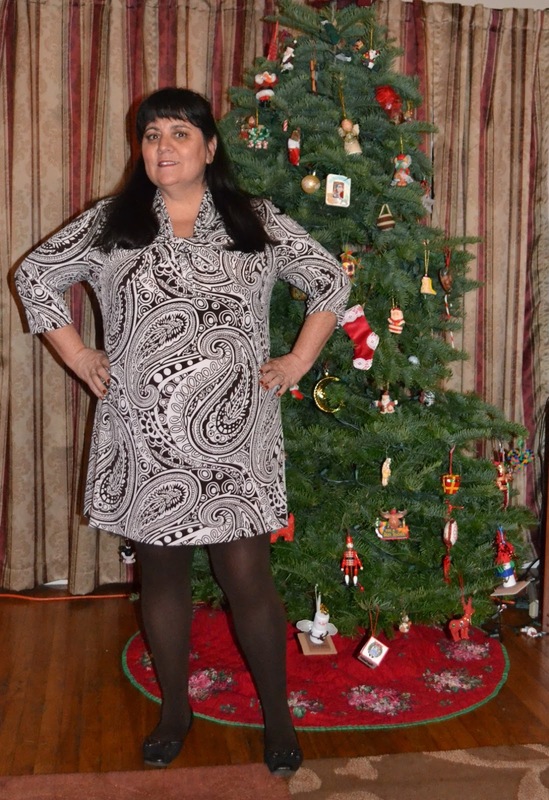 I made my tunic on my newest sewing machine. 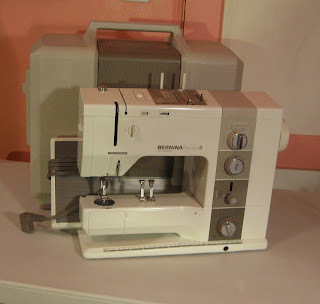 I've actually purchased two sewing machines since I last blogged regularly. However, I also sold one of my Singer 500a machines so the other one didn't count. At least that's my story and I'm sticking to it. This Bernina 930 Record machine was found in a thrift store. A long, long time ago I was without a sewing machine and my sister wasn't using her Bernina 930, so I talked her into letting me use it. After nearly two years, she wanted it back. Because of that, I knew exactly what this machine was when I saw the box on the shelf. I opened it up and was disappointed to see that it didn't have the accessories box or the extension table. The knee lift was the only thing in the box besides the machine, foot pedal, and cord. For the last week I stalked the employees at the store bugging them to find the parts for me. No luck. I didn't buy it the day I found it, but went back for it the next day after thinking about it all night. Good thing too because they were having a 30% off sale the next day. I'm not sure why it didn't get snatched up sooner. I searched through my own stash of feet and found that I still had the buttonhole foot and the zipper foot from my Bernina 1230 that I no longer own. They fit perfectly. The machine was also missing the bobbin case, but I had an extra one of those too. It's a great machine, but to be honest, I like sewing on my Rocketeer better. Mostly because I can control the pressure foot pressure, so I'm debating with myself about selling this one. Even with the missing parts, I think I can ask five or six hundred dollars for it. Here's a nice picture of a few of my other machines. I shared pictures of these before except for the red one in the bottom corner. It is my other newest machine. This one is a Viking 6570 and is a contemporary of the Bernina 930, but it came reconditioned and with all its parts. And it's RED! If you know anyone looking for a Bernina 930, let me know.